The design of the 180 STOVE incorporates 3 sides for wind screening and heat focusing with an open end allowing ample room for feeding natural fuels into the large fire box. When needed, the sturdy sides support heavier cookware than other backpacking stoves. We engineered the 6 pieces of the 180 STOVE to interlock together creating a very stable unit with no moving parts which often fail in the field. An additional end rail can also be purchased with your stove if you prefer to have a 4-sided unit. Just select this option at checkout. 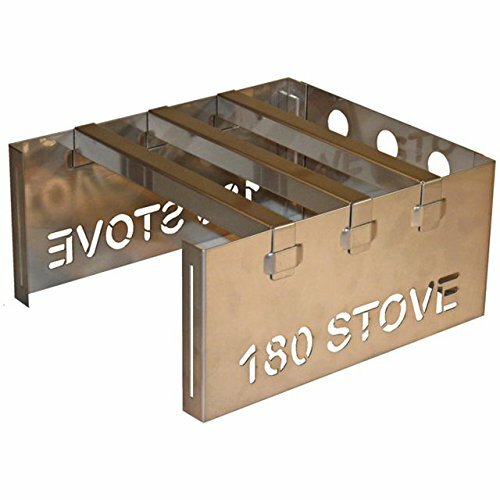 The interlocking tab & slot design of the 180 STOVE provides a very stable unit that uses no hinges, rivets, or spot welds. We've designed a sustainable & durable product that will last you for years. The 180 STOVE disassembles quickly stacking into its own clean, compact case with any dirty surfaces on the inside keeping your pack clean. Made in the U.S.A. This stove is built to last from high quality 304 Stainless Steel. Carry NO Fuel. Just grab your stove and go. Also great for emergency preparedness and survival kits. Large & Stable Cooking Surface: 7" x 6.25" - The size of your typical backpacking mess kitt, but will handle large or heavy cookware when needed. Not top-heavy like other camp stoves. Environmentally Friendly. Includes a reuseable & resealable carry pouch. No waste alternative. If you have any questions about this product by 180 Tack, contact us by completing and submitting the form below. If you are looking for a specif part number, please include it with your message.